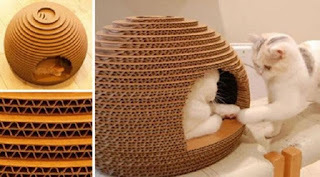 Your cat will love to meander through her very own playhouse, which you can construct from cardboard boxes in just a few simple steps. Cut the cardboad circle. each circle has different size. Just the bottom side has a same size. Arrange the circled-cut carboard become a half circle ball. Start from bottom side and glue it. Cut to design the door.